The power of peer support services has reached a high level of visibility, and measureable success that is now recognized nationwide and is being funded by state and local governments, community healthcare providers and managed care. Clinic services are changing at a rapid pace as well and looking to new and innovative approaches to achieve desired outcomes. Join 3 of New York’s leading Peer innovators as they share a backdrop on the growing sophistication and emerging evidence for the effectiveness of peer run service innovations. 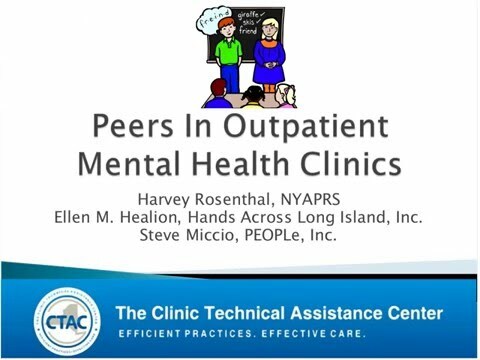 Hear about some real world examples of how peers have been working in a clinical settings in New York. Join us as we discuss the issues that may arise with implementation and share in the positive outcomes of true service transformation. service, managed care, outcomes, peers, quality, peer support, innovation, innovative, peer run service, Ney York, implementation, service transformation.